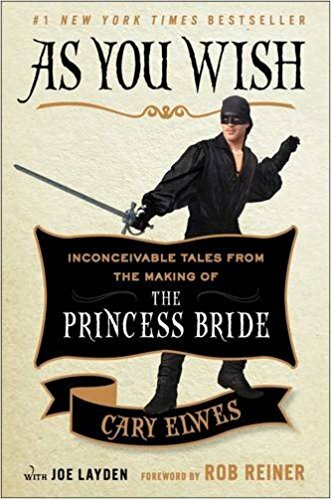 Like many people out there, I'd read and loved The Princess Bride, by William Goldman. Its subtitle says it's "S. Morgenstern's Classic Tale of True Love and High Adventure,"which is the framing device Goldman used to make his novel that much more off-kilter. The story Goldman told, with the beautiful Princess Buttercup and her dashing Man in Black swashbuckling their way through a fire swamp, pirates, giants, swordsmen, evildoers and Rodents of Unusual Size, was hard to define -- Was it children's adventure? Satire? Fantasy? Romance? -- but it found an audience with the right slightly snarky frame of mind to embrace it. But that was as far as it went for a long time. The Princess Bride script became famous as, year after year, it landed on lists of the best undeveloped properties in Hollywood. I remember discussing it with the friend who gave me a copy of The Princess Bride. My half of the conversation was something like, "I love this book. I love this book. I want a movie! How can it not get picked up?" But there it sat, until Rob Reiner decided he wanted to direct a movie of The Princess Bride. With all the challenges inherent in the material, it got made and released in 1987. And it was beautiful. The Princess Bride, the movie, did OK at the box office, nothing major. But after it came and went in movie theaters, The Princess Bride came back to life, not unlike Westley in the hands of Miracle Max. Suddenly it had cult status. It was revived in film festivals, it made lists of the best movies ever, and fans held conventions where they could dress up as their favorite characters and run around telling people, "Hello! My name is Inigo Montoya! You killed my father! Prepare to die!" Cary Elwes has a unique perspective on The Princess Bride. He was immersed in it. A young actor with only a few credits when he was cast as Westley, the boy who is smitten with Princess Buttercup and will strive to do whatever she asks, he approached it with awe and excitement, as well as a sense of joy, that he got to work on this particular film with these particular people. As he says in As You Wish, the book he's written about his behind-the-scenes (actually inside-the-scenes) experience, "I think we all knew knew we were part of something special. Did we think the movie would become an enduring pop-culture phenomenon? Of course not. But did we feel involved in something truly unique? Definitely. For myself I just felt enormously grateful to be there. To be involved in a project with so many gifted people, not to mention getting to be in a film written by the legendary William Goldman an directed by the remarkable Rob Reiner. Life is good, I thought." Elwes talks at length about how much he enjoyed each of his colleagues, coming back to his appreciation for Reiner again and again, with lovely stories about Reiner and Goldman as well Andre the Giant, Billy Crystal, Christopher Guest, Carol Kane, Mandy Patinkin, Chris Sarandon, Fred Savage, Wallace Shawn, Robin Wright, and the experts who taught them fencing as well as a diminutive stuntman who played a Rodent of Unusual Size. Quotes from most of them are scattered throughout the book. Elwes' tone is congenial and charming throughout, even when things get sticky, like his experience sitting immobile and covered in plaster of Paris with straws up his nose to get a mold for his pirate mask, the laborious process of learning to fence like an expert for the Greatest Swordfight in Modern History, or having to rescue his leading lady after she's been set on fire and dropped into a pit of quicksand. Elwes himself comes off just as "fearless and elegant, romantic and brave" as the character he's playing. Well done, Cary. As You Wish takes the reader past the filming of The Princess Bride into its initial lukewarm reception at the box office and through its rebirth, all the way to the 25th reunion of the cast when it was screened at Lincoln Center, with love flowing from the crowd of fans shouting along to all the lines. It's the happy ending you wish for all for favorites, and not unlike the ending in the movie. 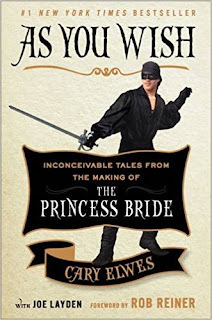 As You Wish is available at Amazon and Barnes and Noble online, and there is still just enough time to get it for Christmas for The Princess Bride lovers on your list. This book's existence feels like a special gift, just for me. Because if there's any movie for which I want to read an I-was-there book -- one that will tell me what it was like to work with each of those performers and craftspeople -- it's this one. And if there's a member of the cast whom I would ideally prefer to be the author, it's Cary Elwes. And he tells me literally everything I wanted to know. (What did he think when he first saw Robin Wright? How did he manage to train for that sword fight? What was it like to be around Andre the Giant?) Thank you for noticing my wish list, Mr. Elwes. He comes off so incredibly charming and happy as out narrator, even when he jumped into the pit and all that. Given the times we're in, I kept thinking as I read, "Don't let a creep come in and ruin this for everyone!" But they all got along beautifully and it was a great experience for all of them, even the neurotic ones! What a joy.